This article first appeared in The Edge Financial Daily, on February 18, 2019. 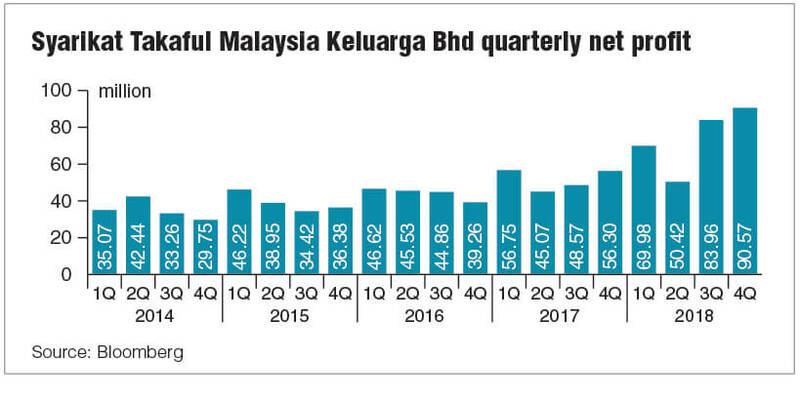 KUALA LUMPUR: While general insurance players are expected to continue seeing their margins squeezed in the near future, takaful operator Syarikat Takaful Malaysia Keluarga Bhd has emerged as a bright spot in the industry. Of the nine listed insurance providers on Bursa Malaysia, Syarikat Takaful is the only pure takaful operator. And it has been on a winning streak, posting a record net profit of RM294.92 million for its financial year ended Dec 31, 2018 (FY18), a 43% jump from the previous year. 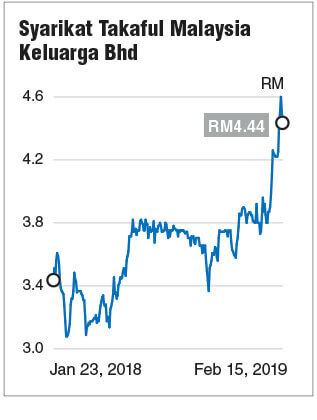 Following the results announcement on Jan 24, the group’s share price rallied and reached its all-time high of RM4.60 last Wednesday, after rising 62 sen or 15.6%. The stock has pared some gains after that and closed at RM4.40 last Friday, giving it a market capitalisation of RM3.66 billion. The stock remains on the “buy” list of all analysts covering it, according to Bloomberg data. The consensus 12-month target price (TP) among the five latest forecasts for Syarikat Takaful is RM5.10, a premium of 15.9% to its latest closing price. In the past 12 months, the stock has climbed 44.2%. “Syarikat Takaful has achieved a strong underwriting performance, which is in line with the takaful industry’s growth trend,” said Khoo Zhen Ye, an analyst at MIDF Research, adding that the achievement was primarily driven by the group’s family takaful segment, which makes up about 70% of the group’s gross earned contributions. Keith Wee at UOB Kay Hian, who noted that the group’s net profit for its fourth quarter of FY18 came in above expectations, said it was supported by improvements in management expenses and claims ratio. The group’s earnings have also shown stronger-than-expected growth in overall premiums. UOB KayHian has the highest TP of RM5.82 for Syarikat Takaful. “The group is likely to sustain its strong premiums growth into 2019 as it will mark the full-year contribution of its recent bancassurance tie-up with Bank Rakyat as a preferred bancassurance partner,” Wee said in a Jan 25 report. He noted that bancassurance represents 55% of Syarikat Takaful’s family takaful premiums and 43% of group premiums. On top of that, the group has gained from a growing traction in online sales, Wee said, which has resulted in lower agency commissions having to be paid out. This represents an advantage for Syarikat Takaful in an increasingly competitive environment, which sees insurance players striving to distinguish themselves via their distribution channels. MIDF’s Khoo, meanwhile, told The Edge Financial Daily that digital technology would play a significant role in the insurance sector’s underwriting business and would be one of the main focuses in FY19, due to the adoption of risk-based pricing following the detariffication of motor and fire insurance in 2019. “One of the main challenges for insurers this year will be to cope with increased regulation,” he said, pointing to the minimum allocation rate (MAR) required for investment-linked products starting this year. This may further compress margins for insurance players as it requires them to retain a higher portion of premiums to customers’ funds, Khoo noted. “We are of the view that the MAR impact will be more significant on life insurance companies compared to the takaful operations, as investment-linked products account for most of the new premiums in the life insurance sector,” he said. Insurers also recently had to account for an increase in impairments under the Malaysian Financial Reporting Standards (MFRS) 9. However, it is the implementation of the MFRS 17 in January 2021 that will be even more game-changing for the sector, particularly life insurers. For it will change the way they recognise revenue and profits from customers, spreading it over the lifespan of the insurance policies. At present, general insurance players including LPI Capital Bhd, Allianz Malaysia Bhd and Tune Protect Group Bhd have been seeing slight growth. “The general insurance growth rate for the first nine months of 2018 was marginal [at about 1.5%], so we expect the earnings growth of LPI Capital and Tune Protect to be flat in 2018, compared to takaful operators,” Khoo said. On Jan 29, LPI Capital posted a 1.2% rise in net profit to RM84 million for its fourth quarter ended Dec 31, 2018, although net profit was flat for the full year at RM314.05 million despite revenue climbing 2.9% to RM1.51 billion — largely contributed by its general insurance segment. Trading at RM16.38 a share, LPI Capital has climbed 6.6% in the past one year, while Allianz is up near 6% at RM13.50; Tune Protect, however, has retreated 35% to 65 sen. The government’s introduction of the mySalam health protection scheme for the bottom 40% (B40) of the population is seen by some as a potential boost for the sector. Launched on Jan 23, the programme is currently supported by RM2 billion contributed by Great Eastern Life Malaysia for an initial five-year period. The government has called for more insurers to contribute towards the scheme, and MIDF’s Khoo views it as a good starting point to educate and spread awareness of the role of insurance among the B40. “We view the focus by the government on the insurance penetration rate among B40 to be positive for insurers as it forces the insurers to come up with innovative distribution platforms and products to tap into this largely underserved market and can contribute to its bottom line as well in the long run,” he said. However, not all analysts are as positive on further growth from the initiative. AmInvestment Bank’s Kelvin Ong, for one, does not think the initiative will have a significant impact on insurers, as their offerings for the lower-income segment are already cheap. “Plain protection policies are already in place by most insurers, so I don’t think the focus on B40 will affect existing players,” he told the The Edge Financial Daily. It is worth noting that the central bank and various insurance associations have long striven to make insurance more affordable for Malaysians. This has included the launch of the Perlindungan Tenang initiative, which was launched in November 2017 and saw 10 affordable protection plans made available to the B40. “At this juncture, we believe the growth of the industry will continue to be led by the higher take-up rate of takaful products due to wider awareness and favourable demographic pattern in the domestic market. As such, our top pick remains Syarikat Takaful, with a TP of RM4.75,” Khoo added.